Here's a quick glance at the YAIAA wrestlers who earned medals at Saturday's District 3 championships. 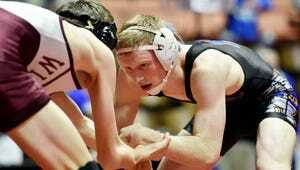 The top five placers in each District 3 Class AAA tournament weight class qualified for the PIAA Class AAA championships, which will be held March 10-12 at the Giant Center. The top five placers in each District 3 Class AA tournament weight class qualified for the PIAA Southeast Region Tournament, which will be held March 4-5 at Wilson High School.